There's a storm brewing here in Southern Sweden and I don't like it. The only positive is that it's supposed to snow tonight and I do love a little snow around Christmas! 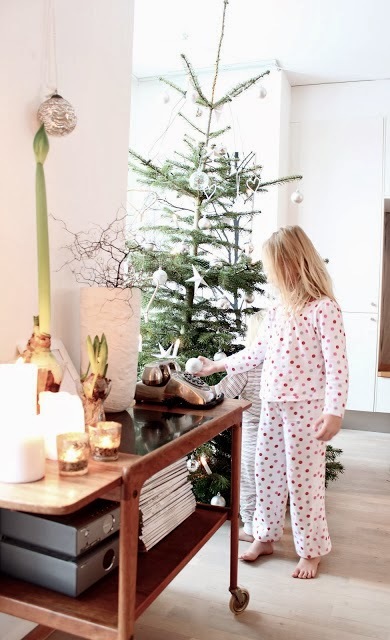 Since we're hoping to visit Katrinetorp Christmas market tomorrow and chopping down our tree on Saturday I'm definitely starting to get into the Christmas mood! before the decorating begins I thought I'd share a few pictures of our home from last Christmas. Makes me realise how much there is to do! If you'd like to see a few more pictures and find out where some of the items are from you are welcome to follow these links: my christmas work space, my Christmas sitting room and my Christmas tree. Oh and if you think you may be looking for a more unconventional tree this year you must check out these ideas and this DIY project! PS My Scandinavian Home featured in the Smallable advent calendar yesterday - you can find a short interview behind 4th December if you fancy a read! Those large white stars are very beautiful. What are they made of? Paper? 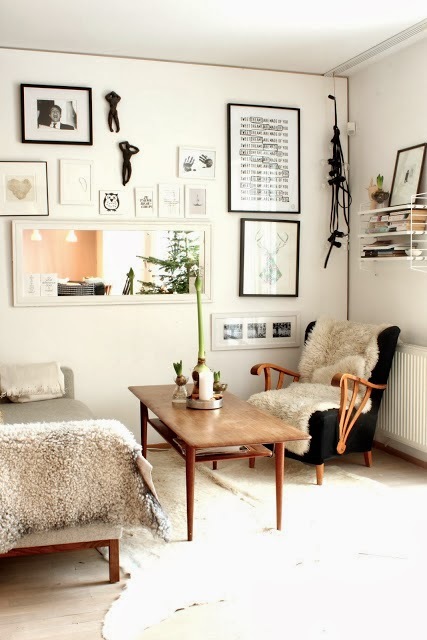 i love your home, and i love this blog of yours! so happy i stumbled upon it the other week. i live in malmö and am indoors right now, expecting the storm to arrive any time soon. I love it all the stars, the birch, the mercury glass! We finally had snow yesterday & it does feel more Christmasy, now come the arctic temps. Thank you Caroline! It was a lovely tree wasn't it? I'm thinking of going for something a little more a-symmetric this year but then again I say that every year! Your home is lovely! I love your style-plain and simple, yet so classy. Small details make big difference. Great job! I feels warm and cosy.What more can I say? Love it!! Thank you! It was a really lovely cosy Christmas. I hope I can re-create the same feel this year! Now this is serious inspiration! :) Also, I want to congratulate you for this beautiful blog you created. Sometimes I just can't stop clicking in the links on "related posts". 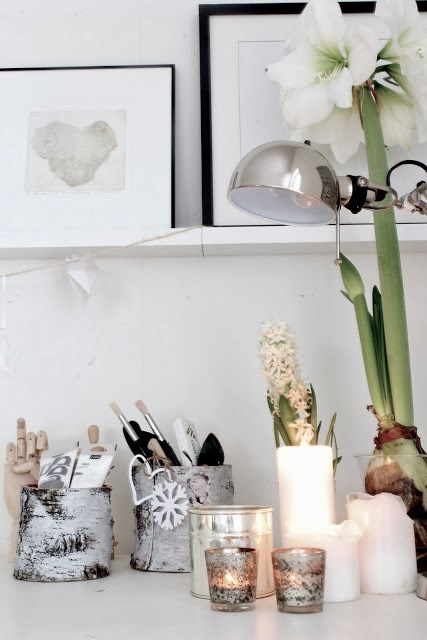 I love the lamp on your working desk: what make is it? Yay so lovely, haven't been here in a while (work has been driving me crazy), but happy to be back. Happy Christmas! Wow, lovely home, very inspiring! I have two questions for you : 1) The white and grey fur on the chairs, is it sheep fur ? 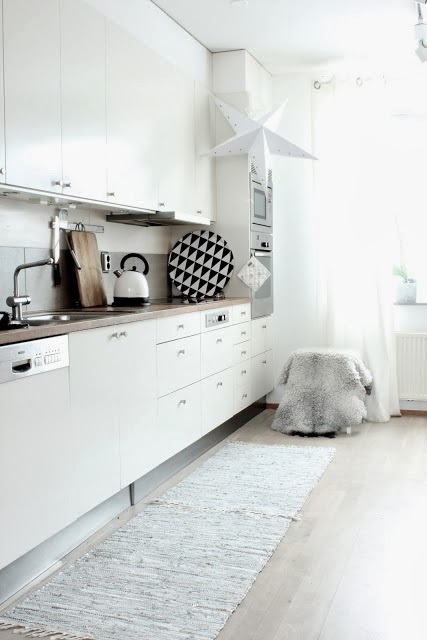 2) The black and white geometric plate in your kitchen, where did you get it ? Lovely home! And lovely blog, very glad I stumbled across it! I was wondering, if maybe you could do something on smaller spaces. I'm going back home in May (potentially) after finishing uni and I would love to give it a revamp, get a double bed in there etc but my room isn't that big. Would love to read a post on your thoughts and suggestions. Your home is breathtaking. I especially love your kitchen. I also love your antique phones which create such great character to the room! I love this so much. You added so many nice touches! I especially like your home office, it's just lovely.